- To secure a booking, a non refundable deposit of £50 is required. - A £50 bond is required which is refunded at the end of your holiday as long as there is NO damage to the van or contents and its left clean & tidy and you meet the hiring terms and conditions. - Booking form with Hiring terms & conditions will be emailed or posted once booking confirmed. This is required to be completed and returned prior to your stay. - Email confirmation of payments will be provided. - Full balance to be paid 1 month before holiday. - Passes are NOT included but can be purchased from the Haven reception desk. - A Duvet, Pillows and Bed Linen for each bed is included in the cost. - Bookings available: Friday to Monday (3 Nights), Monday to Friday (4 Nights), Friday to Friday (7 Nights) or Saturday to Saturday (7 Nights). 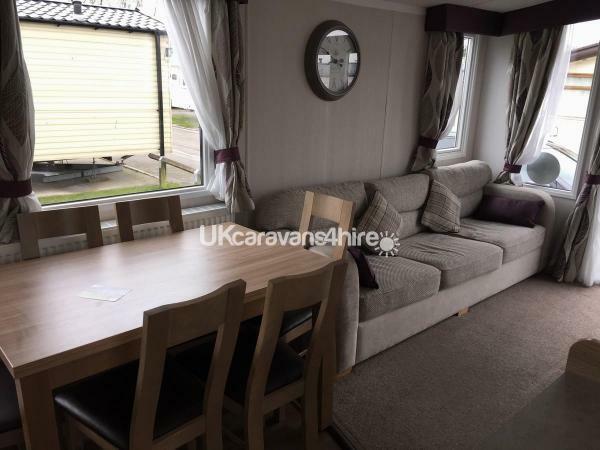 This caravan for hire is situated on Cala Gran Holiday Park in Fleetwood. The caravan is well equipped and includes a LCD TV and DVD Player in the lounge with free-view, kitchen with toaster and microwave, Central heating, Double glazing, own car park space, Large decking area at front the caravan with seating, Iron & Iron board available upon request, shaver point, en-suite bathroom in main bedroom. Wall mounted TV in main bedroom. Good local transport links which includes buses to Blackpool and Fleetwood outside of park entrance, There are some good local restaurants the nearest being the Iron Horse part of the hungry horse chain, which is very good and child friendly. There is Asda and Morrisons close by, nearest beach is Rossall which is within 2 miles, Farmer Parrs is a short walking distance from entrance, other close beaches are at Cleveleys and Fleetwood. There is everything you could need on the park should you wish to stay on site, a well stocked Spar shop, Mash and Barrel restaurant with daily promotions and an onsite laundry. We just back from our holiday ???? This Is our time booking with this family. They are very helpful, very welcoming on arrival. 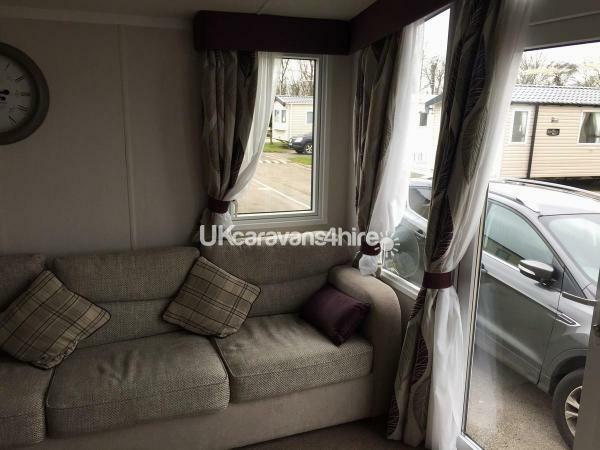 Caravan is very modern and spotless, lovely seating area. Bedding made ready and very fresh smelling, for a lovely nights sleep. Enjoyed a great 3 night stay and could not fault the caravan, very clean, comfortable with a some nice touches (cloths, washing up liquid etc etc). The owner Wayne forwarded very clear instructions via e-mail while booking, staying and leaving the caravan. 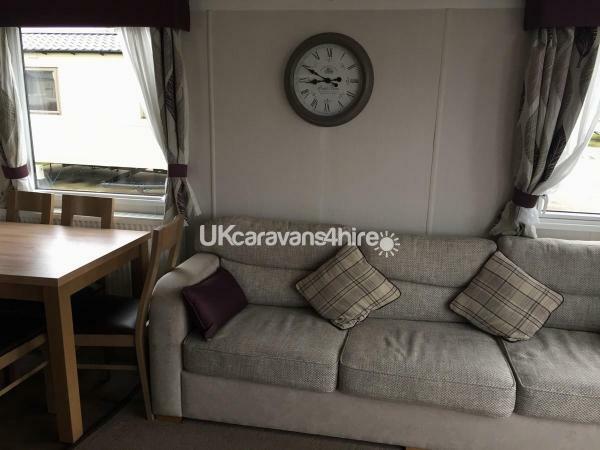 The caravan itself was in a great location, approximately 5 minutes walk from the main site so no noise and benefited from a large flat screen in the living room as well as TV's in the other bedrooms. Overall an excellent stay supported by excellent service and will be looking to book again next year. 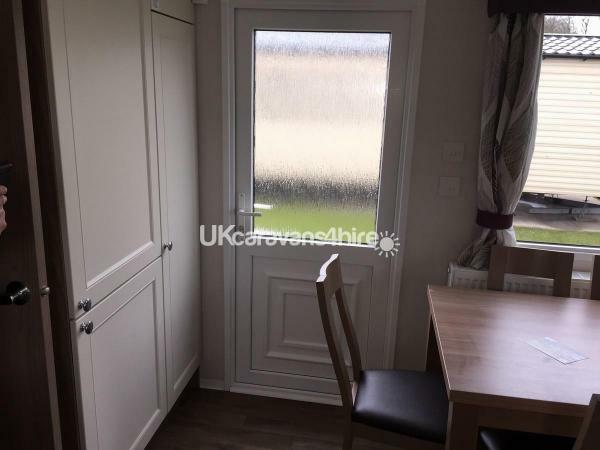 Absolutely gorgeous caravan,a luxury, a tele in all 3 bedrooms and one in living room, my kids were over the moon with that. En suite bath room in double bedroom. All bedding made on our arrival. Full side fridge freezer. I was totally gob smacked, And in love with the caravan, we could have stayed a lot longer and really didn't want to leave. Entertainment on site was really good. We loved every minute of our holiday. Nothing was ever a problem for Wayne and was always on hand to help straight away. I booked abit last minute as I was joining some other friends who had already booked in other caravans with there families, and they was all very jealous of my luxury caravan haha. I would highly highly recommend this caravan. Thank you so much for letting the caravan to us. 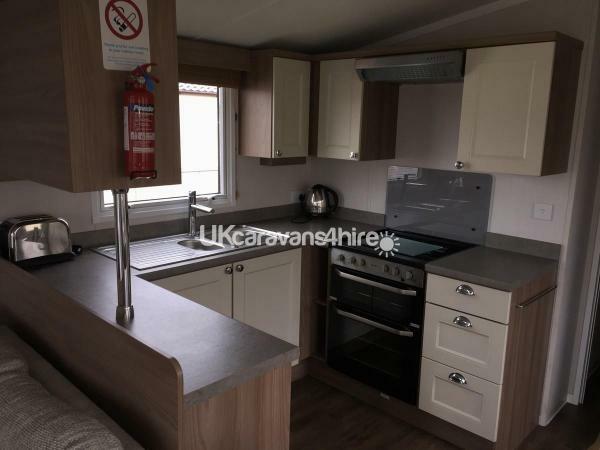 Lovely clean and spacious caravan. Very modern and well maintained making it a very comfortable stay. Bedrooms all a good size. Kitchen very large with full size fridge freezer and oven/hob. Wayne was extremely friendly and polite when we arrived and had been communicating leading up to our stay with information. I would recommend this caravan to anyone. Nice farm across the road for a day out and Blackpool is not far with lots to do. By far the nicest and largest caravan I have stayed in. Thanks Wayne. I recently had the pleasure of staying in this caravan. I was welcomed by the owners parents to recieve the keys and shown around the van and were everything was situated. The caravan is lovely clean, tidy and very comfortable. It was not to far from the complex and parking was near. I would definitely recommend this caravan to anybody and i would certainly use it again myself. Thankyou to the owners for a lovely break. Went with 3 children 7, 9 and 10. Caravan was spotless. Kids loved having their own tvs in bedrooms. Thought bunk bed room was brilliant for the 2 boys. Lots of space. Huge tv in lounge. Bedding lovely and fresh.Huge fridge/freezer in kitchen. Loved the en suite toilet in main bedroom. Service from Wayne and family was excellent. Staff at reception very friendly when key had to be left there as we were not arriving until later. Would recommend this lovely modern, spacious caravan to families with children. If we were to stay at Cala Gran again we would not hesitate to contact Wayne. Stayed in this caravan with a five young children for a long weekend before they started back at school. We had a lovely time. Extremely clean, fresh bedding, very well equipped, tv's in all the bedrooms, spacious. The family we hired from were also very helpful I would 100% recommend and will coming back again. Thank you for a brill stay. We had a fantastic stay in a lovely caravan and great location. It was the perfect distance away from the main attraction. The caravan was spotlessly clean with the added benefit of ensuite and full sized fridge freezer. The bed linen was clean and fresh upon arrival. We received excellent customer service and my deposit was paid back very quickly. Would highly recommend and would definitely stay again should we go back to Carla gran in the future. A lovely caravan in an ideal location. 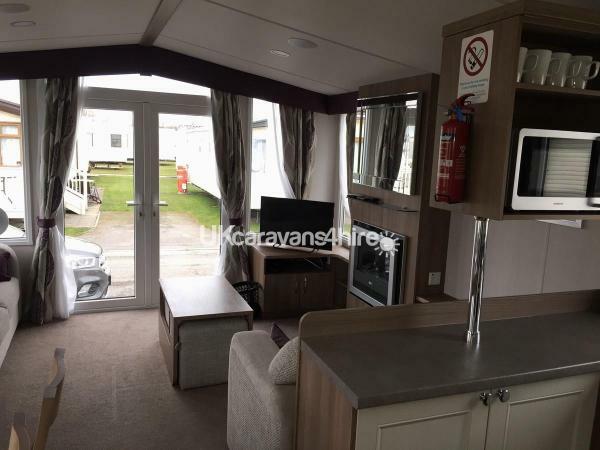 Very clean and modern with en suite bathroom, full size fridge freezer and DVD player which you don't often get in caravans in our experience. The owners are very helpful and customer service was excellent. 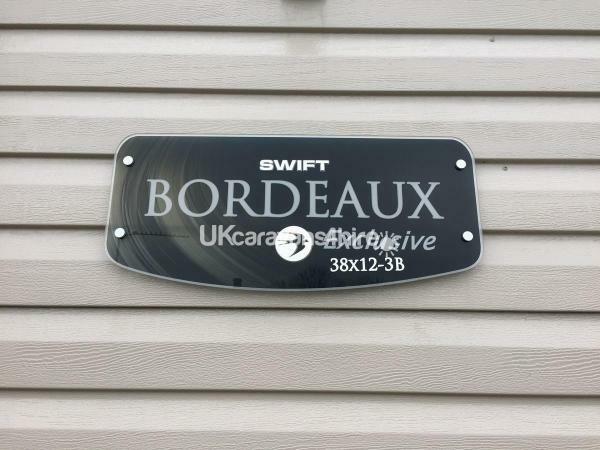 would definitely recommend this caravan and we will be looking at staying here again in the future. 5 star accommodation, everything you need, spotlessly clean and I must comment we had bed linen supplied and it was freshly washed and smelt really really lovely. The caravan is up to date and is very organised, the shower is a good size and ideal for fitting small or bigger kids in without difficulty. As others have said it's not too far that you have to drive but far enough that your not kept awake at night from the entertainment. And the owner Wayne, was straightforward and a pleasure to deal with, nothing was too much trouble really really good. In all everything was spot on no fuss booking, lovely accommodation at an excellent price. Thanks Wayne we are already looking for next year. There were 8 of us - 5 adults and 3 children - maximum occupancy! Cosy but space divided well and fantastic facilities both in the caravan and on the main site! Wayne (the owner) was fantastic too - perfect communication throughout!! Great location for the Illuminations - just 15 mins away and the farm across the road is perfect!! Really enjoyed our stay - highly recommended!! The caravan was excellent, very clean and tidy, one of the best ones we have stayed in. Had everything we needed. Was in a great place on the complex whereby we weren't too close to the main facilities but were within quick walking distance. As a family with two very young children the overall complex and facilities were great and we thoroughly enjoyed our week away. Overall we had a great time and would like to thank Wayne for the great caravan and welcome we received. Would definitely recommend anyone to hire this caravan. Everything was 5 star and excellent. Van was clean, modern and extremely spacious. Sharing with 4 kids 2 of which are teenage boys space and comfort was a must which your van had plenty of. It was close enough to the main entertainment area but not close enough that you were disturbed by any noise at night! Would definitely stay again (if we don't bring the dogs) and would most definitely recommend it to family and friends. We can't fault the caravan or the owner ... the pictures don't do it justice. Spotless an we opted for linen (bed covers) like new clean and fresh . Caravan 5 min walk from complex so no noise yet still close by , we will be contacting Wayne next time we go back to Cala Gran to re hire his gorgeous caravan can't fault it !